When it comes to sewing lapped and flat-felled seams in heavy fabrics, Lap seam foot # 71 (8mm) is your dependable partner. Use it to sew two-step flat-felled seams on jeans or sportswear simply by sewing the layers wrong sides together. A channel on the left of the presser foot tip holds the turned-under fabric in place for the second line of stitching. By using Lap seam foot # 71 (8mm) both raw edges are encased in the seam, making this presser foot suitable for sewing reversible items of clothing. 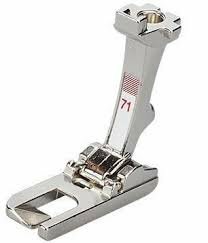 Get professional results with Lap seam foot # 71 (8mm) – your presser foot for straight seams such as side seams and yokes.